The City of Rancho Cordova was awarded bronze level status in the League of American Bicyclist’s Bicycle Friendly Community (BFC) program. 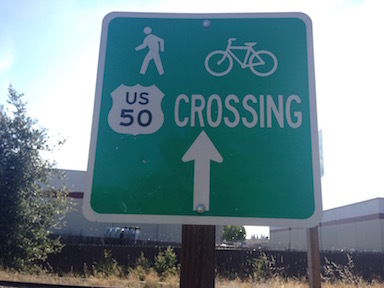 Rancho is the first of the communities within the new Bicycle Friendly 50 effort, though Folsom had earlier achieved silver status. The Bicycle Friendly 50 group, including 50 Corridor TMA and the city hosted two Traffic Skills 101 courses and a League Cycling Instructor (LCI) Seminar in 2014, training two city employees and a number of community members. An education program is one of the requirements for achieving BFC status. Above is a wayfinding sign in Rancho Cordova, which seems to have installed more than other communities in the Sacramento region.